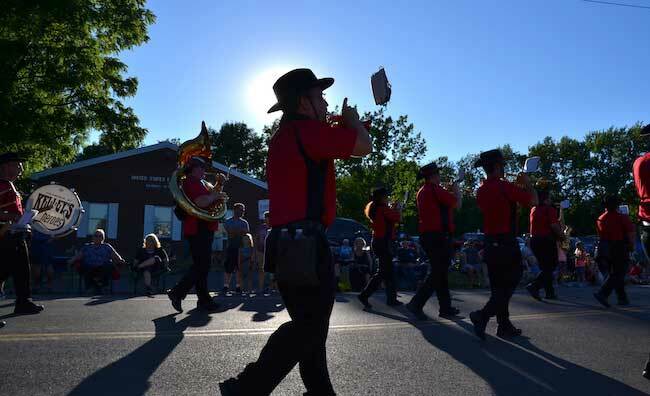 KENDALL – Kelley’s Heroes from Caledonia performs in Friday’s parade for the Kendall Firemen’s Carnival. 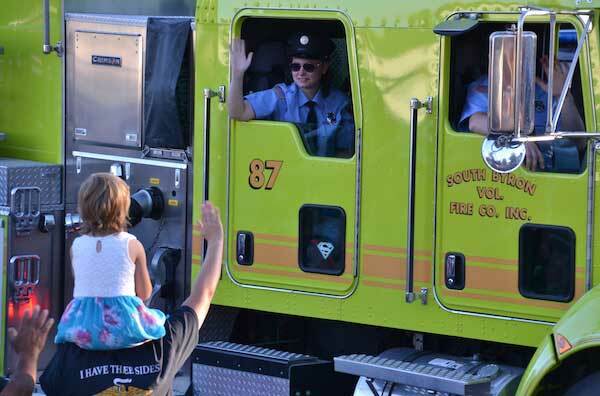 There was a long lineup of fire trucks, bands and community floats during the parade. The three-day carnival concludes today. 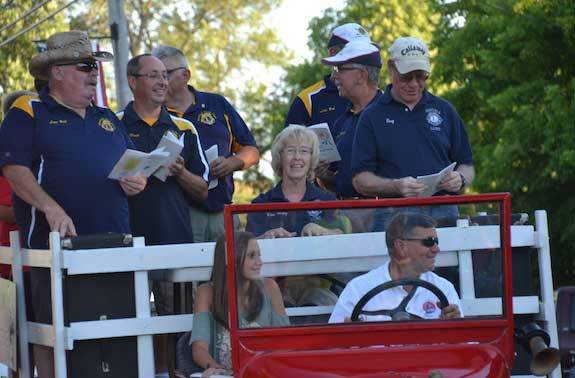 Gary Kludt drives a 1923 Model T carrying the Kendall Singers, who are members of the Kendall Lions Club. 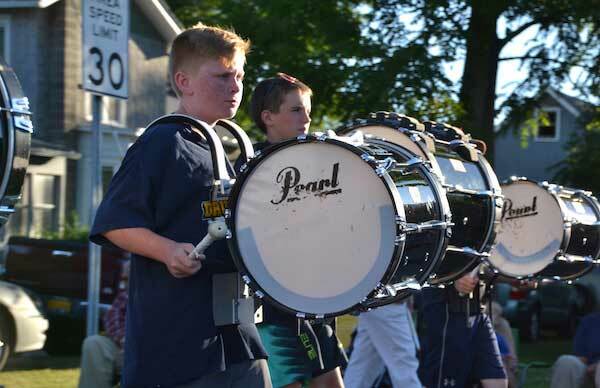 The Cosgrove Middle School drumline from Spencerport performed in the parade. 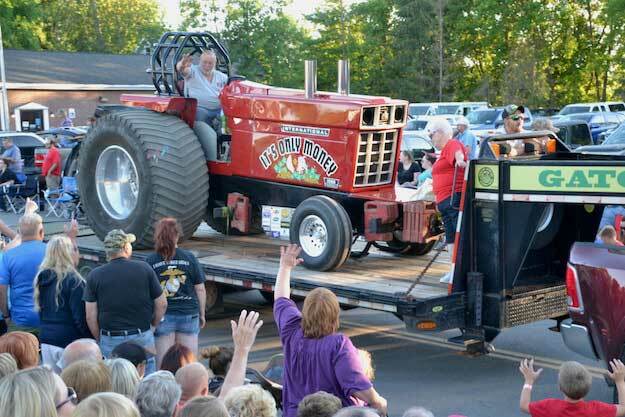 Lloyd Christ of Holley brought his tractor, “It’s Only Money,” in the parade to promote the Murray Tractor Pull on July 14-15. The tractors will compete at a track developed by Christ on Groth Road. He competes in the heavy super stock class. Kim Corcoran is the leader of the Kendall Lawn Chair Ladies. The group is a crowd favorite. 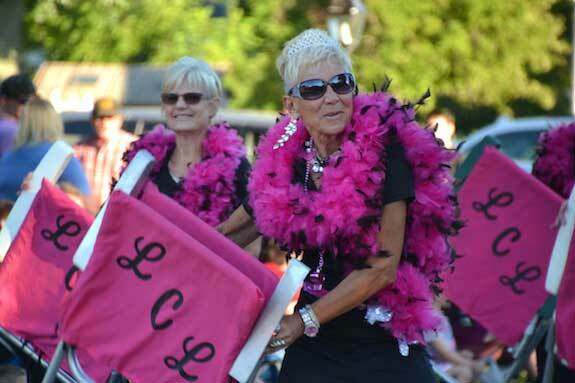 They perform at many local parades. 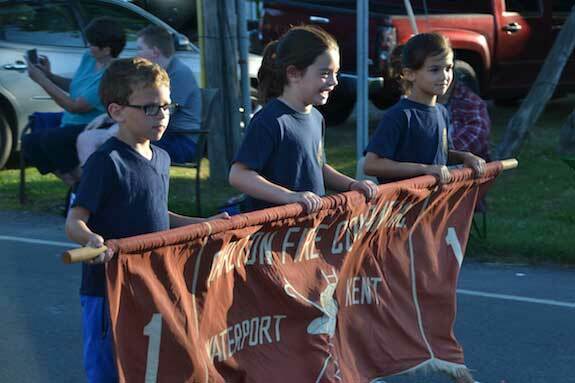 These kids carry the banner for the Carlton Volunteer Fire Company. They include, from left: Ridgeley Graeham, Emma Dumrese and Alivia Dumrese. This was the first time kids have carried the banner for the fire company. 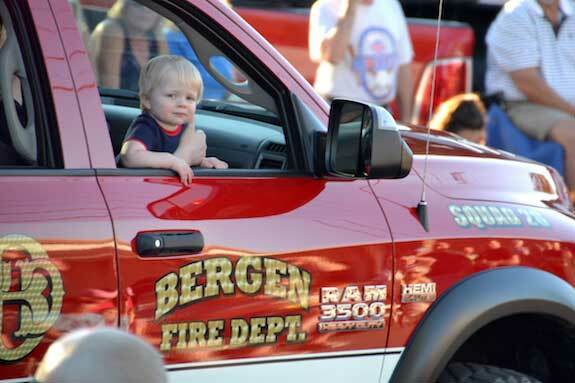 This boy enjoys a ride in a Bergen fire vehicle. There were 15 fire companies in the parade. South Byron firefighters are acknowledged by the crowd. 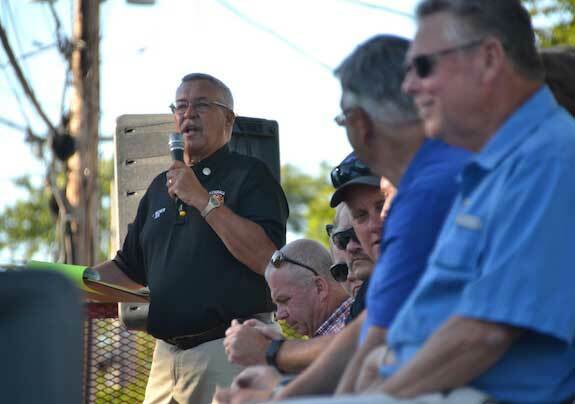 John Becker once again served as the parade announcer. He was joined on a review stand by local officials, including County Legislator Ken DeRoller at right. 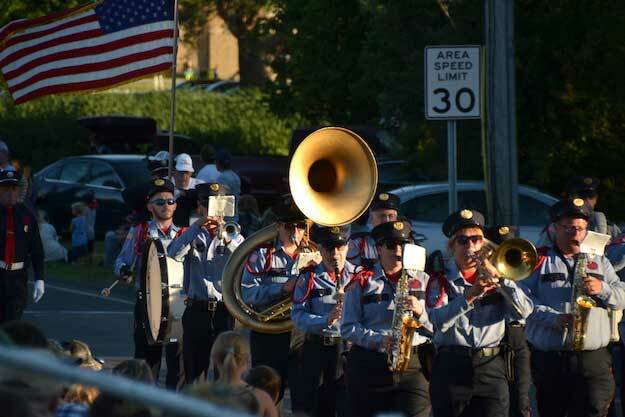 The Alexander Fireman’s Band gave a spirited performance. 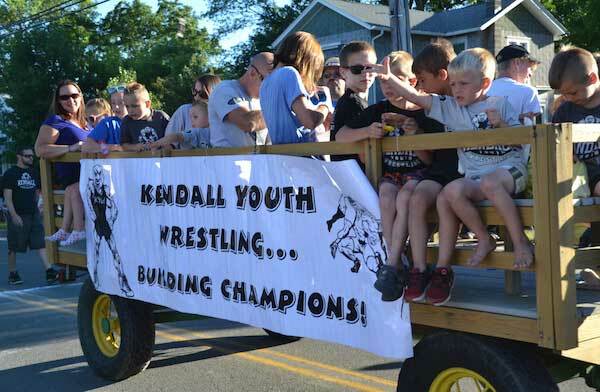 Wrestlers promote their program and toss candy to kids along the parade route. 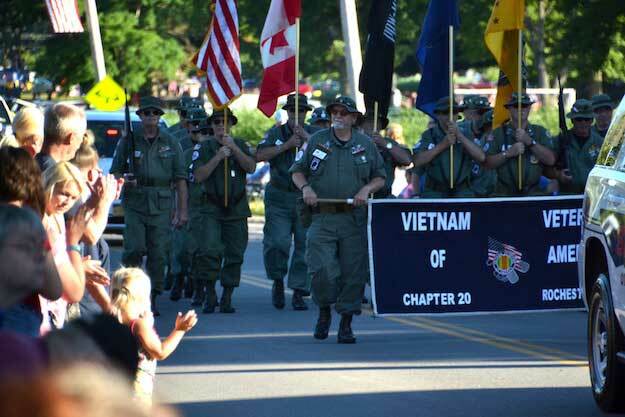 The crowd gave a standing ovation to the Vietnam Veterans of American, Chapter 20 out of Rochester. 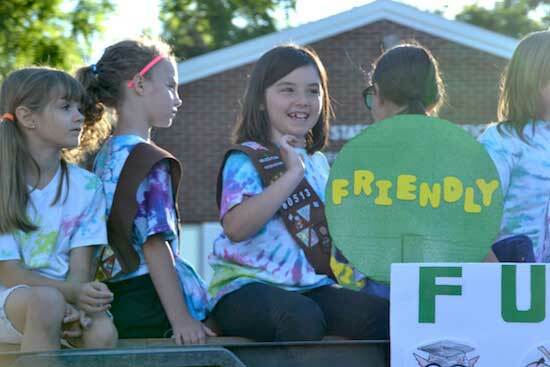 Local Girl Scouts also joined the parade. 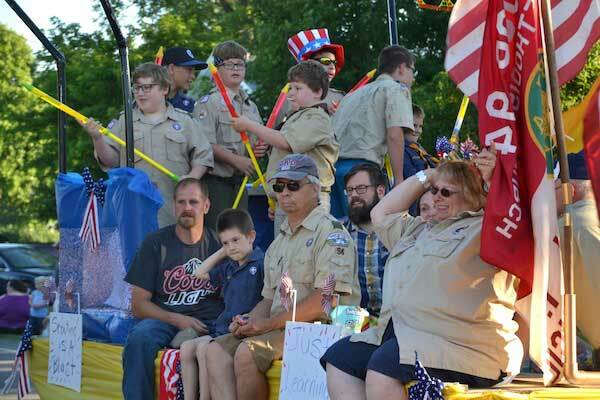 Boy Scouts urged others to join the program. 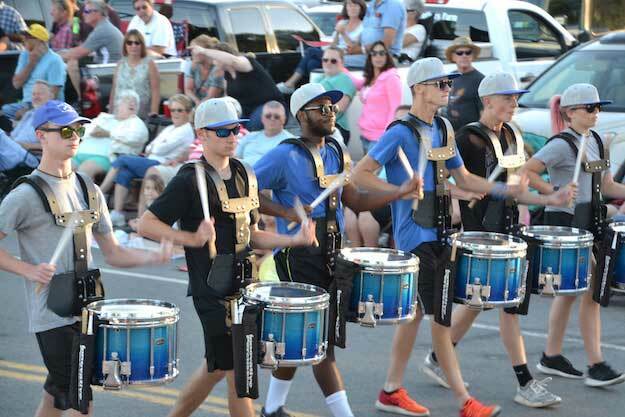 The drumline for the White Sabers Drum and Bugle Corps in Dansville made the trip to Kendall. The White Sabers will be back today in Kendall at 4 to perform at the Fireman’s Carnival. • Cruise in Car Show from 4-7 p.m.
• Ride Matinée from 1-5 p.m., and 6-10 p.m.
• Chicken BBQ at 5 p.m.
• 7th Heaven from 9 p.m. to 1 a.m.
• Fireworks at 10:30 p.m. 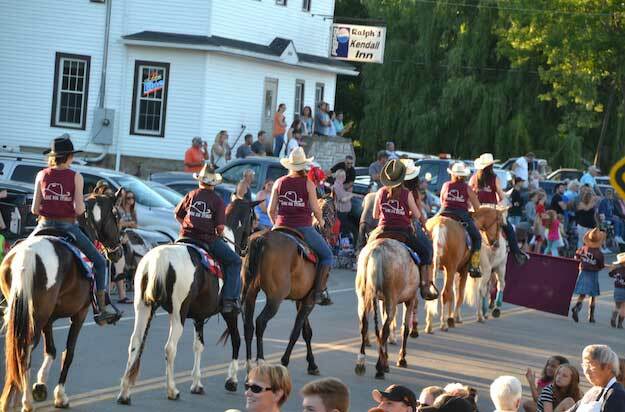 The parade concluded with riders from Lone Oak Stables in Kendall.